If you haven’t explored all the benefits of better invoices yet, now is the time to get started. A few simple tweaks to your current setup may greatly enhance your image. There are two important deadlines for any freelancer: when your work is needed and when your payment is due. To set proper expectations for all parties, make sure those deadlines are clear before signing any contract or agreeing to any project. It’s important that you’re ready to deal with any billing issues that arise from missed deadlines. There will likely be times when you aren’t paid as planned. If you’re nervous to talk with a client about a missed payment, don’t be. Sometimes people fall behind or are distracted with other things. Any client worth working for won’t mind being approached about a missed payment. However, there are people who will try to take advantage of you. One way to avoid this is to have penalties for late payments written into your contract. For example, if a payment if five business days late, a $50 fee or a fee that is five percent of the contact can be added. Think about what numbers work best for you and your client. You can always negotiate with them before the contract is signed. 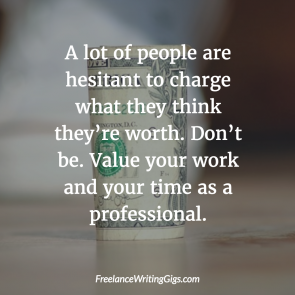 A lot of people are hesitant to charge what they think they’re worth. Don’t be. Value your work and your time as a professional. 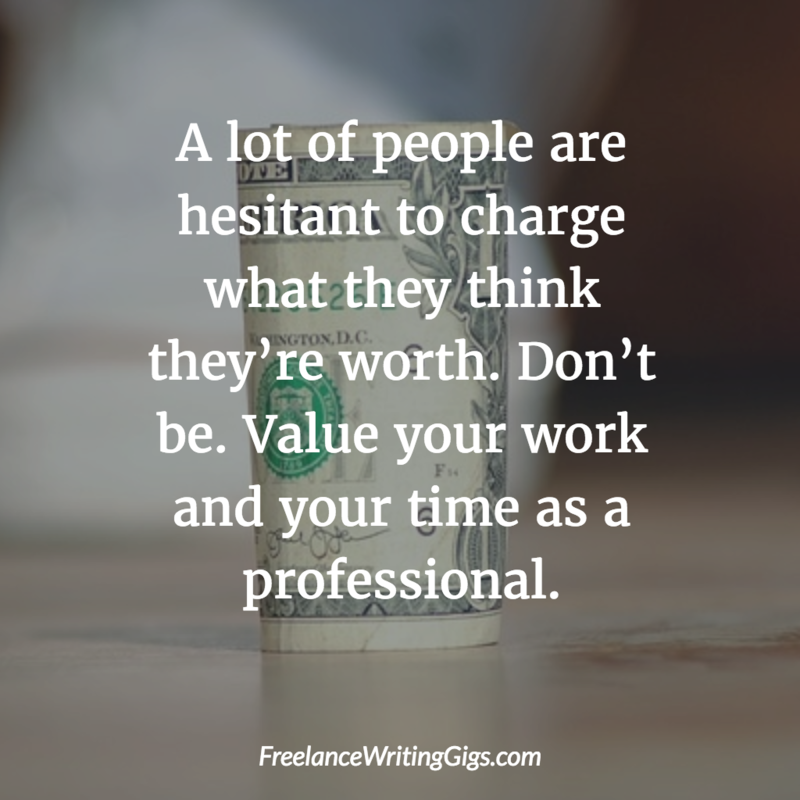 It is also essential to know what prices freelancers with similar education, experience, and other assets charge so that you don’t price yourself out of jobs. When setting prices, you can either let the client offer a price or set a price for them to accept or reject. If you’re responding to clients advertising for specific projects, they will probably have a set rate. If people are reaching out to you, be prepared to offer your own. Decide whether you want to work on a per-project basis or if you’d rather charge by the hour. Different projects can be billed differently. If it’s an open-ended project and you aren’t sure how long it will take, consider billing hourly. If you know how much time you’ll dedicate to a project, consider offering a per-project rate. In that case, though, be aware of how many revisions you’re willing to offer in the base price, and what extra revisions or additional work will cost your client. It’s always better to have payment amounts understood by both parties up front. When it’s time to bill a client, an attractive invoice will set you apart from others. It should look professional, be easy to read and contain all the required information. Unless you have extensive experience with graphic design, however, a well formatted and streamlined invoice can be hard to make quickly. It may be worth outsourcing the invoice process. Attractive, manageable invoices might seem like a tall order when you’re just starting out. 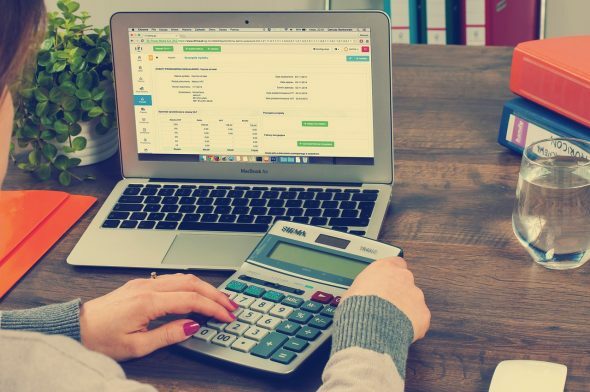 One way some freelancers manage it is by using invoicing services that provide appealing, polished invoices you can fill in and send with no hassle. Using a service doesn’t mean giving up creative control. For example, services like Invoice Home let you create invoices that are personalized with your logo and other information. Another benefit to invoicing services is that they save time. Your time is valuable and every minute spent on record-keeping is a minute that you’re not working on a billable service. Good invoicing software will come in handy time and again as you work with more clients on new projects. One important factor in a reputable business is how well organized and accessible your records are. If you have contact with a client to discuss a project, make a note of it along with the date, time, and what was discussed. When it’s time to move to billing, you’ll have an idea of what projects to include or what hours to put down, depending on your payment structure. Keeping records also means keeping a record of any invoices you’ve generated, payments received, and money spent on contracts. Well-organized records assist you in communicating with clients in two ways. First, it keeps documentation at the ready that you can refer to in any discussion with your client. This assists you in appearing on top of things and reliable. When you’re managing multiple projects, it’s useful to have the records as a reminder for when you switch gears. The other way organized records are helpful is because they provide an overview of the work when it’s time to create an invoice. If you have all the hours, funds, and other aspects of a project at your fingertips, it makes creating an invoice much easier. Digging for files or emails in the hope of throwing together a last minute invoice isn’t professional. Keep everything organized and it will go much smoother. It’s professional and courteous to send invoices on time, every time. Don’t wait to create and deliver your invoice once your work is done and the time is right to get paid. If you do, it’s possible that your client will have moved on to another project and be distracted. Distracted clients can be slower to pay in some situations. If you’ve created policies for your clients, follow them yourself. Always deliver content on time and be ready to send invoices, accept payment, and respond to revision requests. Doing so saves everyone time and makes sure projects are done efficiently. When it comes to billing, record keeping, and invoice creation, approaching them with an eye to professionalism is key. Treat your freelance operation like a business and you’ll get better results. Don’t try to manage everything yourself. It’s okay to outsource or delegate responsibilities to other parties so you can focus on the primary source of your income: your client’s projects. Related: Get new clients with these tips. Good Read. Would love to read more post like this.